Towards the end of the current financial year you may already be thinking about creating your budget for next year or creating a re-forecast for the remainder of current year. When you have multiple business units, this is best achieved using the Budget Factory. 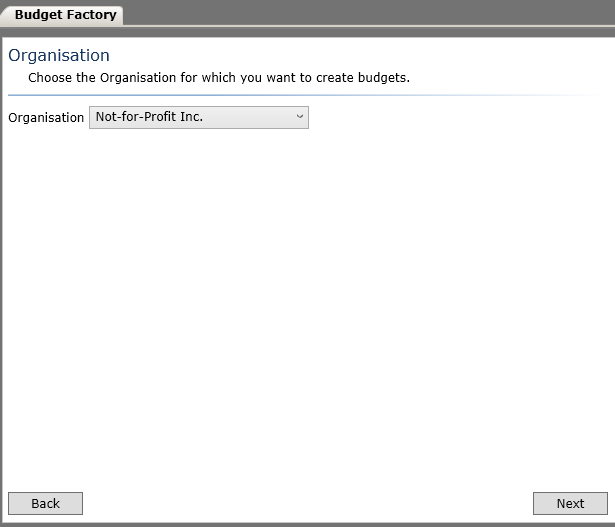 If you are working on a single business unit you can create your new budget using budget shortcuts and the budget grid. 1. 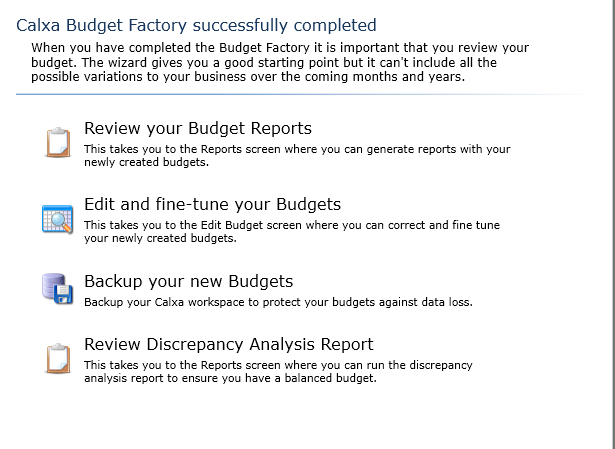 The first step is to set your Last Actuals Period and Main Budget Version on the Organisation Management Screen. On the Organisation Management Screen under Details, set the Last Actuals Period to the last Actuals month you want to use as source data in your new Budget. Set the Main Budget Version to the version you want to use to create the remaining months in the year not populated by this year’s actuals. Click on Save to save your changes. For example, if you set the date to Apr 2015 as in the example below with a FY starting period of July, your budget will be created using July 2014-April 2015 Actuals and May-June 2015 Main Budget Version. Note: In most cases it is not necessary to select the Organisation name as well as business units. If your organisation budget is always a consolidation of business units you do not need to maintain an organisation budget. For further explanation please refer to the help note article – Understanding Calxa Business Units and Budget Versions. Select the current financial year as your Base year. Example: for financial year ending 30/06/2015 select 2014-15. Select Actuals as your Source Data. Since you are using YTD actuals rather than a full year of actuals, you will see a Warning message, ‘Actuals are not available for all months in the selected financial year’. For the empty months, the main budget version information will be used instead. This is why we selected the Main Budget Version we wanted to use in step 1. 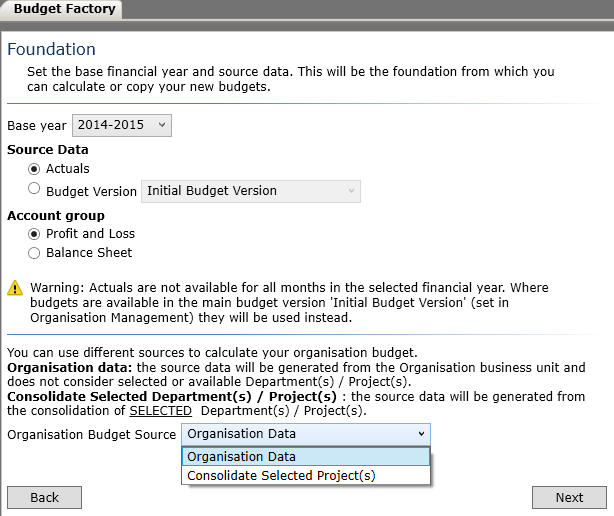 If you opt to create a budget for your organisation, but did not opt to create budgets for your business units, you will be given the option to create the organisation level budget either from the organisation (Organisation Data) or by consolidating all business units (Consolidate All Project(s)). 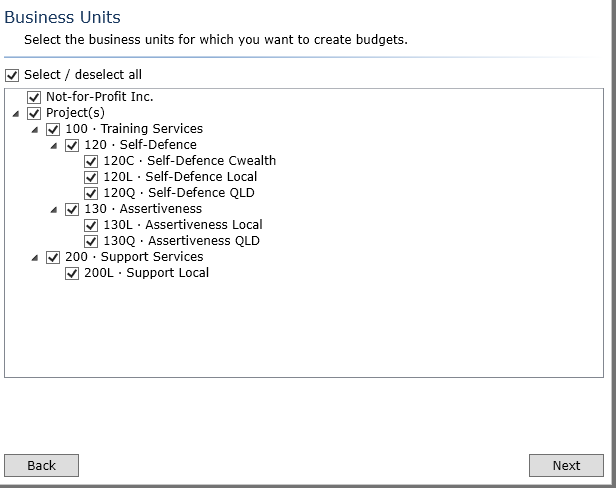 If you opt to create a budget for your organisation as well as your selected business units, you will be given the option to create the organisation level budget either from the organisation (Organisation Data) or by consolidating the business units you selected in the previous screen (Consolidate Selected Project(s)). Specify the year(s) you want to create your budgets for. Note: To create a budget for financial year 2015-2016 which allows you to run cashflow forecast reports throughout this financial year, select From 2015-2016 to 2016-2017. This ensures you will always have at least 12 months budget data going forward from whatever month you report on. Select the budget version that you want to apply the budgets to. 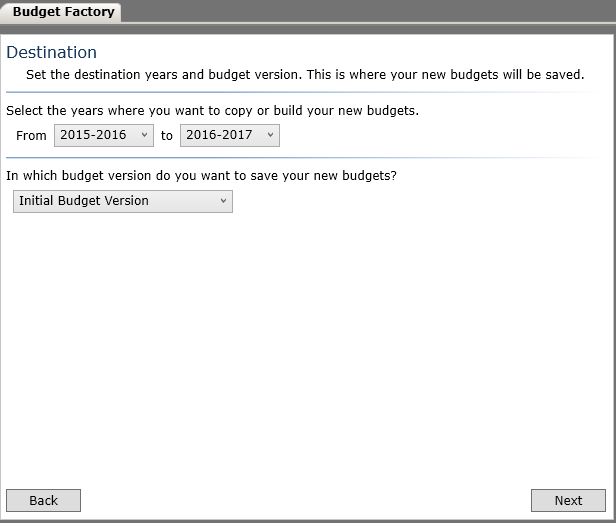 Take care when selecting the budget version, because if you select the wrong version and the relevant financial year(s) is not locked, it will overwrite the budget data for that version. To that end, it is a good policy to lock all Budget Versions’ financial years where no changes should be made as well as Backup your database before importing budgets. This ensures you can restore from backup data if needed. 8. For the next few stages in the Budget Factory you will have an opportunity to adjust each account type category by different amounts. For further explanation please refer to the help note article – Use the Budget factory to Save Time and Create Multiple Budgets. You now have a full year budget populated with YTD Actuals with current forecast for the remaining months. This can be used for either a reforecast of the current financial year or as a base budget for the next financial year. If you have only a few business units or budget at the organisation level only you can use Budget Shortcuts to create your budget. 2. 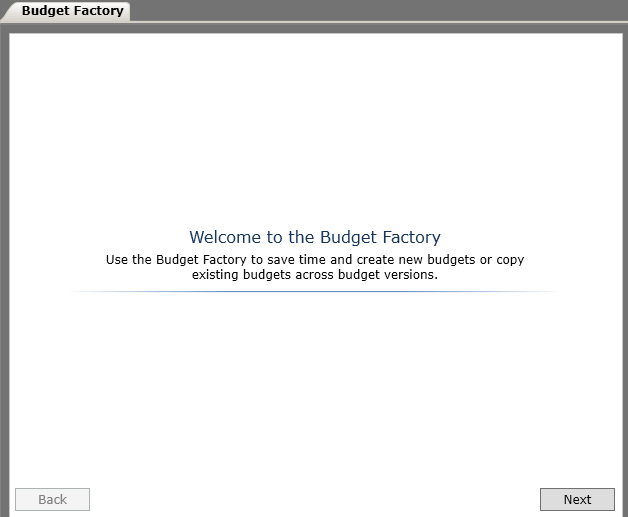 In the Budget Parameters screen, select the Budget Version you want to create your budget in, the Financial Year you want to create, and the Business Unit you will enter the budget in. Click on Open Budget. 3. To populate your budget with YTD Actuals, click at the top of the July column (first month in FY) to highlight all accounts, press your Shift key, then click on the column where your last month’s actuals sit. This will highlight the entire YTD period range. In the example below, April 2015 YTD is highlighted. Now click on Apply Shortcut on your Main Tools bar. Click on All Selected to apply shortcut to all accounts. This will open the Budget Shortcuts box. Choose Calculation Method of Calculation. Business Unit should be set to the one you currently have open to create the budget. Select Value Source should be set to Actuals. Select Account Source should be set to Selected Accounts. Financial Year should be set to the current year to copy YTD Actuals. In this example we are using 2014-2015, and copying July 2014-April 2015 Actuals to create a 2015-2016 budget. Percentage should be set to 100% to copy YTD Actuals, but can be adjusted upwards or downwards as desired to incorporate growth or reduction in your budget. Click Apply to run shortcut. The example below shows April 2015 YTD Actuals populated, with May and June empty. 4. Now we will populate the remaining months of May and June with our current financial year’s budget figures. Click at the top of the May column to highlight all accounts, press your Shift key, then click on the June column. You should now have both May and June columns highlighted. Click on Apply Shortcut on your Main Tools bar. Click on All Selected to apply shortcut to all accounts. This will open the Budget Shortcuts box. Choose Calculation Method of Calculation. Business Unit should be set to the one you currently have open to create the budget. 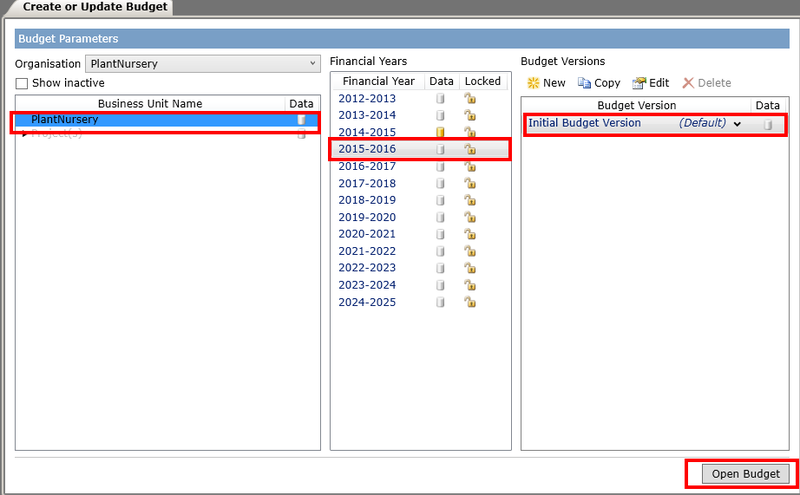 Select Value Source should be set to Budget Version and then select whichever budget version you want to copy from. Select Account Source should be set to Selected Accounts. Financial Year should be set to the current financial year. In this example we are using 2014-2015 to create a 2015-2016 budget. Percentage should be set to 100% to make straight copy of budget, however you may apply a percentage change if desired. Click Apply to run shortcut. You now have a full year budget populated with YTD Actuals and current forecast for the remaining months. This can be used for either a reforecast of the current financial year or as a base budget for the next financial year. *For more detailed instructions on editing please see the article called Edit Budgets using Budget Shortcuts and the Budget Grid.